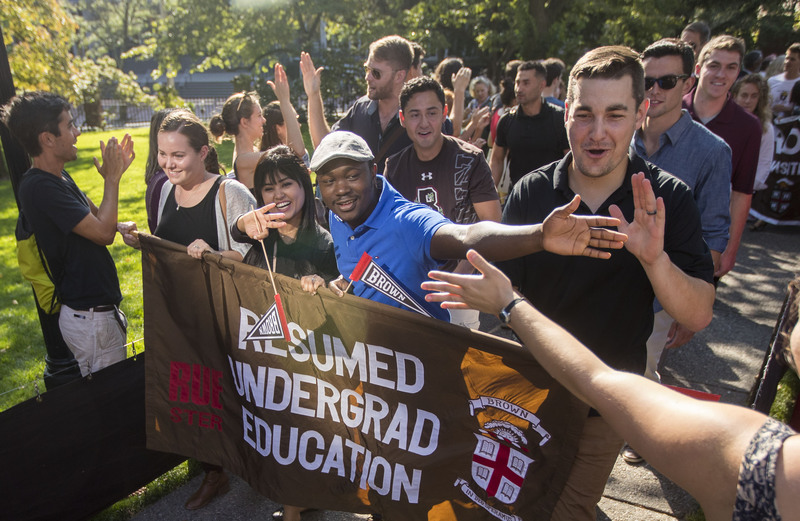 As Class of 2021 students begin their academic journeys at Brown, we asked five of them to tell us where they've been and what they hope for now that they're here. 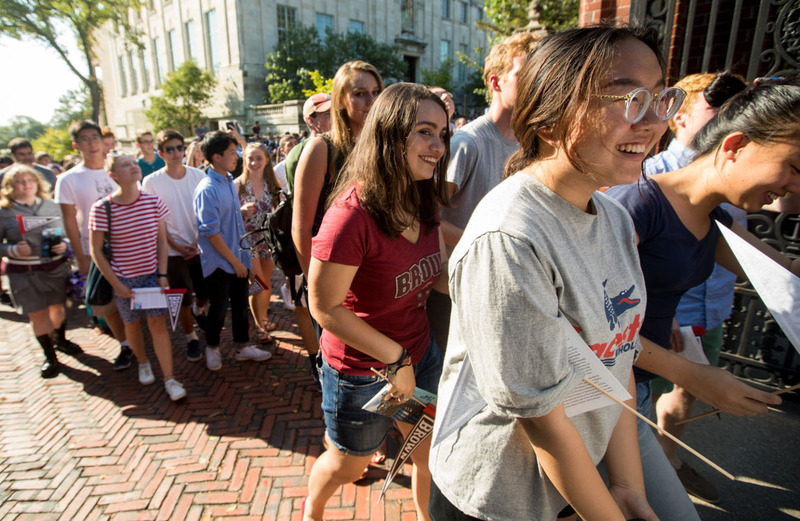 PROVIDENCE, R.I. [Brown University] — Between moving into residence halls, learning how to navigate campus, shopping for classes, saying goodbye to families and getting used to the quirks of college life, it’s been a big week for the 1,719 first-year students who comprise the Class of 2021. Having ventured to College Hill from 68 countries and 49 states across the U.S. — more demographics here — they represent nearly every cultural background, socioeconomic group and religious belief, and they arrive at Brown with distinctive personal histories, perspectives and ambitions. 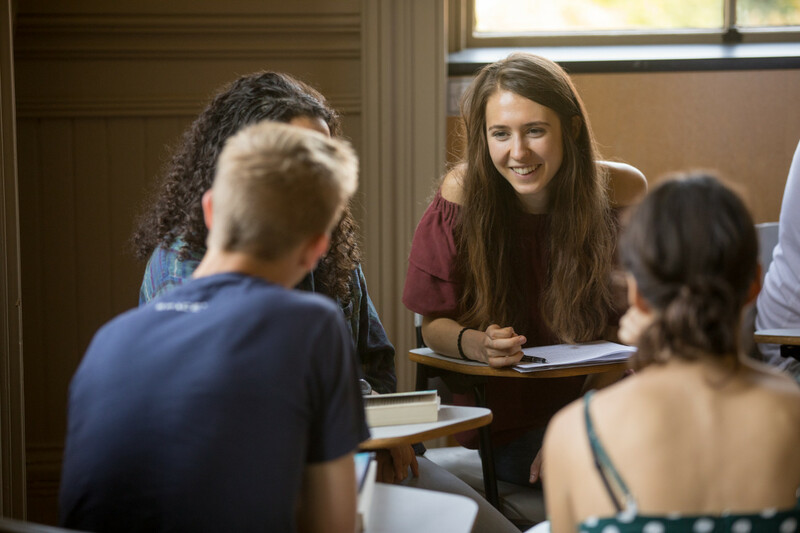 Despite their many differences, talk to any small group of them, and you’ll inevitably find some common themes: a wide variety of academic interests, an intense love of learning and an authentic desire to make an impact on the world. Here are a few of their stories. George Kubai takes part in a First Readings session during orientation. 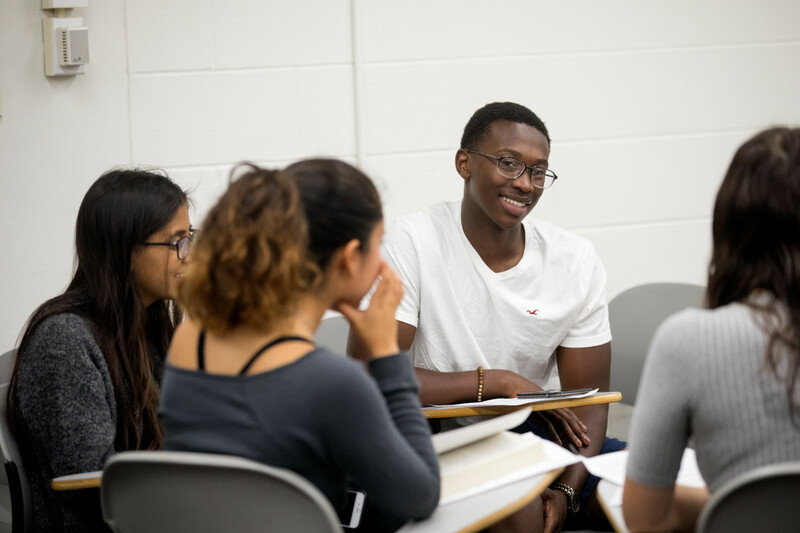 During his junior and senior years of high school, George Kubai immersed himself in the Tenacity Challenge, a Boston-area academic competition for African American and Latino high school students. Teams compete in rigorous quiz-bowl style competitions in science and math and take part in judged projects on history, literature and art. For last year’s history component, teams were asked to consider the question: How do you think Black Lives Matter has been effective or ineffective at bringing about social change? The big challenge: Team members had to go into their community and interview people on both sides of the issue. For Kubai, who says he supports the goals and actions of Black Lives Matter, it was personally rewarding and interesting to interview the person who supported the movement. It was harder, but still interesting, he says, to interview the person who did not. This kind of challenging, and at times very personal, academic inquiry is what Kubai hopes to undertake at Brown. While he has deep-seated interest in science — he is considering biomedical engineering as a concentration and medicine as a future career — he says he chose Brown because the Open Curriculum will allow him to engage deeply in the humanities and social sciences as well. He hopes what he gleans in these academic realms will give him a richer understanding of the societal problems he cares the most about — racism, classism, sexism — and empower him to help remedy them. Sophia Skwarchuk takes part in a First Readings session during orientation. As a high school junior, Sophia Skwarchuk wanted to do more to alleviate hunger in Montana than take part in the occasional food drive. So she applied — and was accepted — to the Governor’s Youth Leadership Council to Fight Childhood Hunger, a group charged with devising innovative ways to combat the problem. That’s when Skwarchuk came up with the idea for her app, Montana Eats, a database that would link those in need, as well as donors, to every food bank and emergency food resource in the state. Skwarchuk had a great idea. But she also had a problem. She knew absolutely nothing about designing a smartphone app, and her small high school didn’t offer any computer science classes. So she did it the old-fashioned way. She headed to the library and taught herself. Her interest in computer science was born. And as a U.S. Army Reserve Officer Training Corps (ROTC) student now at Brown, Skwarchuk is considering merging that interest with her military training by pursuing studies and a career in cyber intelligence. Ultimately, her main goal for the future is one aligned with her work on the childhood hunger council — and with Brown’s mission. 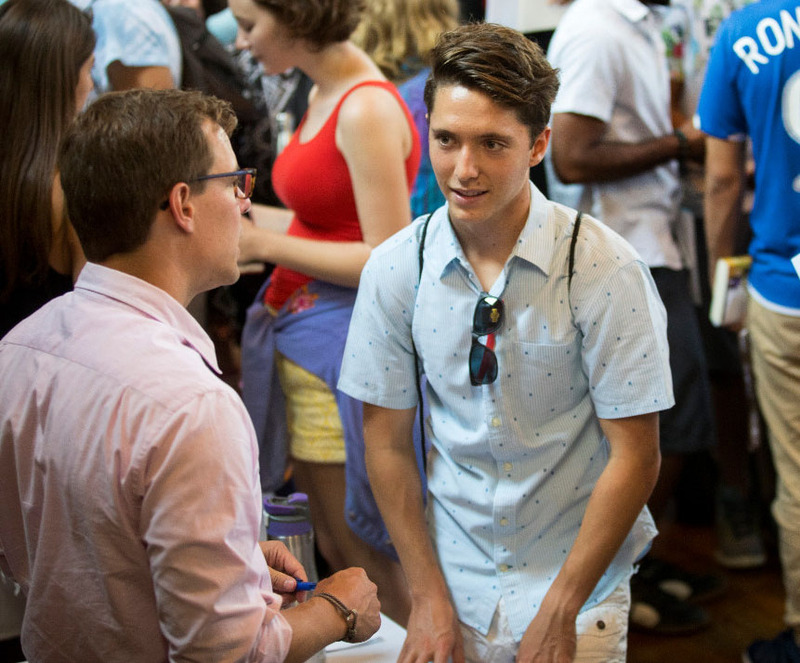 Nathaniel Goodman listens to faculty during the Education Expo in Sayles Hall during orientation. As a high school filmmaker, Nathaniel Goodman launched “Filmmaking for Good.” His goal? To make films that would enhance the missions of local nonprofits by telling the stories of their good work. Through his camera, he featured organizations like ReSurf, through which volunteers rehab surf boards and teach underprivileged kids to surf, and the Jewish Teen Foundation of San Diego, which instills professional and leadership skills though service learning. Goodman’s work eventually landed him a prestigious Diller Teen Tikkun Olam Award, which each year recognizes 15 Jewish teenagers from across the country for their dedication to social change. The same impulse that compelled him to translate his creative skills into a way to help others is what initially attracted him to Brown. Goodman doesn’t yet know what role film will play in his future, but his interests run the gamut. Neuroscience, economics, philosophy, business, computer science, linguistics and physics are just a few of the areas he hopes to explore in the next four years. And that’s ultimately why he chose Brown. Tanzina Chowdhury (second from left) carries the Resumed Undergraduate Education banner during Convocation. Growing up in Bangladesh without the means to afford college, Tanzina Chowdhury was forced to halt her academic pursuits after secondary school. She’d been a high-achieving student and managed to make ends meet by tutoring, until eventually she joined with other women she knew to launch an online business venture that connected rural artisans with urban buyers interested in their products. The business made a modest profit, she says, but she left it behind when she moved from Bangladesh to Florida in 2014, enrolling that winter in Palm Beach State College to finally pursue her dream of a college education. Chowdhury thrived academically at Palm Beach State, enrolled in the honors program and became a member of the Phi Theta Kappa honor society — ultimately becoming one of 55 Jack Kent Cooke scholars from across the nation. Each year, more than 3,000 students apply for this coveted scholarship, which provides community college students up to $40,000 per year to complete their bachelor’s degree. Accepted into Brown’s Resumed Undergraduate Education (RUE) program, Chowdhury plans to study computer science and entrepreneurship, interests that were born while running her venture in Bangladesh. But she also sees her time at Brown as a chance to do a lot of things she’s never tried before. She embraced this goal even before classes started, spending a week hiking and camping in New Hampshire with the Brown Outdoor Leadership Training program on a trip that mixed outdoor experience with the arts. Chowdhury clearly possesses an adventurous spirit, and the primary reason she chose Brown was for the RUE program — and the support and community that it provides. Melanie Anaya, center, walks through the Van Wickle Gates during Convocation. When Melanie Anaya enrolled in advanced placement (AP) science and math classes at her high school, the divide was clear — students of color weren’t represented equitably in these spaces. A Mexican-American, Anaya says she knew this imbalance wasn’t due to intellect or interest, but lack of exposure and encouragement. So Anaya and a friend attacked the problem at the root, creating a STEM program for first-graders in a local, predominately Latinx elementary school. Not only did the program present basic science concepts and engage students in fun, hands-on experiments, but it provided each child with a take-home glossary that translated the scientific terms they were learning into Spanish. Being able to share school experiences at home is important to kids from families where English is not the first language — it helps them stay motivated, Anaya says. She knew her STEM program had made an impact on the program’s last day, when she asked the first-graders the same question she had offered up on the first. Now a new student in Brown’s highly competitive Program in Liberal Medical Education, Anaya says Brown interested her as a place where she could pursue her academic interests in both social justice and science, a marriage of passions that she says will make her a better doctor as she seeks to help those most marginalized in society. “I am just excited to be part of community that is so in love with learning and that really wants to make a difference,” she said. Among the most popular intended areas of concentration are engineering, computer science, biology, biochemistry and molecular biology; business, entrepreneurship and organizations; political science, economics, neuroscience and international relations.